In today’s episode, we will explain our absence and kick off the holidays with some road-tripping tips (AKA don’t make yourself miserable! ), and a HOLIDAY GIFT GUIDE! Just in time for cyber week! We thought long and hard about our gift recommendations, and we are claiming these as fool-proof! If you’re struggling to decide what to get for your husband, wife, toddlers, or in-laws, we gotcha covered! We are so grateful for all of you- thanks for listening! Please subscribe and leave us a review! It would be the best gift you could ever give us this season. Episode 16: Unconventional Marriage in The Big Apple: An Interview with actress, Whitney Uland. Today’s interview is going to change your life, friends! Whitney Uland is an actress, writer and producer on film and stage, currently living in New York City with her husband of 6 years! From Whitney’s experiences in marriage, loss and acting we will learn all kinds of excellent marriage advice such as how to make time for one another, simple ways to bond, and the importance of supporting and cheering one another on. We will also talk about life in New York, and Whitney’s impressive and intriguing career! This is not an episode to miss! This is an episode we are very excited for! Join us today as we chat about SIDE HUSTLES in all of their different forms, and what kinds of creative and financial value they add to our life! We will share some of the results from our Instagram poll, and explore different kinds of side hustles, as well as the ones we invest our time in! You will get the inside scoop on Maren’s writing jobs, Dallin’s videography and, of course, the behind-the-scenes info on our podcast! We will share how it came about, and our process for recording and producing! That’s not even the best part! Later in the episode, we will hear from a dad, husband and entrepreneur who started his own side hustle of all side hustles- Bacon. Hunter Sebresos will talk to us about the importance of pursuing creative endeavors, and the stress and reward of providing for a family. This episode is seriously chalk-full of good information, inside info, and as always- zero filter! We hope you love it, and we’d love to hear about your side hustles! If you actually want to buy it, email us and we’ll send it to you! Please reach out to us and let us know what you think! Visit www.bacon.work/bothofus to earn and extra $5 on your first job! Review, subscribe, let us know how you feel! We love our listeners! Have a great week from Both of Us! Today, Maren will have an enlightening interview with down-to-earth, Sarah Benson. Sarah is the creator of a health and wellness platform and certified herbalist, as well as a wife and “hippie mama”! Not only will this interview open your eyes on matters of mental, physical and spiritual health, but give some practical and easy tips to get started right now on a journey to a more holistic lifestyle! We will chat about the affects of social media on mental health, the importance of slowing down and caring for ourselves, as well as some tips for forming more real connections! Sarah’s insights on marriage and her philosophies on parenting are so inspiring, and her overall laid back and earthy personality is so fun to get to know. We hope you enjoy this episode, and stay tuned to the end for some bonus content- a short interview with Sarah’s husband, Greg, who wanted to give his side of their “love story”. As always, please let us know what you think of the episode! Sign up for Bacon at www.bacon.work/bothofus to earn an extra $5 when you work your first job! Bacon allows you to find one-time jobs for businesses in your area! Bacon is like Uber, but helps anyone to get their side-hustle on! We are back! We took a mid-season break last week to visit the Happiest Place on Earth! This time around we had even MORE fun than usual, and learned an awful lot about how to be successful at Disneyland with little ones! We will reminisce on some of our favorite moments from this trip as well as just laugh like usual. We hope this episode is as enjoyable for you Disney-lovers as it is helpful! visit www.bacon.work/bothofus to sign up and earn an extra $5 when you work your first job! Please subscribe, review and contact us with questions, comments and feedback! This truly is such a good episode, chalk full of content to make your day that much brighter! And please, as always, subscribe and leave a review below! This episode is purely for your entertainment, and honestly, we tried to keep it educational but might have laughed way too much for that! From Gordon Ramsey (and Dallin’s surprisingly accurate impersonations) to Queer Eye, we will be hitting on all kinds of reality TV shows, and our recommendations/observations. Poor Dallin has been dragged into this world since saying “I do” and now you can be too! As always, we will give our undying love to The Amazing Race, and a special shout out to Kylo Ren’s version of Undercover Boss. Don’t take this one too seriously, just know that “we are here for the right reasons”. As always, please review, subscribe & reach out to us! We love to hear your feedback. Bacon is like Uber, but for all kinds of short-term, one-time jobs for companies in your area! Visit www.bacon.work/bothofus to get an extra $5 when you work your first job! In this episode, Dallin will have a light-hearted and inspirational chat with Dr. Mary Rice! Mary is a professor of literacy, and expert on education, even in the home! She will share the benefits of both home schooling and public school, how to utilize technology and literacy with our children, and how to start NOW in preparing our young ones for an academic future! She also opens up about her long journey to Motherhood, and inspirational road to earning a Ph.D in Teaching, and Curriculum. This girl KNOWS HER STUFF. Of course, she will talk about her marriage, and even her love for Drop Dead Diva! Please let us know what you loved about this interview! Subscribe to Dr. Mary Rice’s scholastic work here. And to view where she’s published, click here. AND, as always, please reach out and chat with us! We love to hear from you! Bacon is like Uber, but for all kinds of jobs! Visit www.bacon.work/bothofus for an extra $5 on your first job! And as always, thanks for subscribing and reviewing as a way to help us make awesome content like this! We decided to dive deep into some of the questions we would have previously shied away from! You’ve been asking, and we answered. This episode is completely uncut, and unrehearsed! You’ll hear us talk about our family planning decisions, Dallin’s time stuck in the middle of the Ukrainian Revolution, some scary parenting moments involving a screwdriver, and the importance of kindness to all people. We will talk about our favorite spots to vacation, how we met, our parenting preferences, and how very IMPERFECT and OPPOSITE we are. You basically wrote this episode, and it gets deep. So thank you all for letting us open up! As a side note, THANK YOU for helping us reach 4,000 subscribers in one month! Today, you will listen to an inspirational and relatable interview with Sarah Powers! Sarah is the host of ‘The Mom Hour’ podcast, a writer, wife, and mom of three! In this interview we will laugh about some of our “parenting fails” (even though they aren’t fails- just moments! ), explore Sarah’s career path in writing and podcasting, talk social media use, and of course, marriage! Sarah will share some amazing advice about how to discover and pursue your creative passions, and help you feel better about whatever season you’re in- even if you don’t have a spare minute! Dallin will join us in the intro to talk about late night sugar cookie dates and our run-in with Moana! We hope you enjoy this as much as we did! Visit www.bacon.work/bothofus for an extra $5 on your first job! Don’t forget to subscribe and review! As promised, here is Henry’s awesome dance. In this episode, join Both of Us as we chat about Date Night! How we make it happen, ways to save money (including our very repetitive at-home dates), babysitter hacks, the magic of “quiet rooms” and our favorite free dates (we can never get enough Barnes n Noble!) We will talk about who is responsible for planning said date nights, why we think it’s 100% necessary, and that one time Maren was lured into THE Bat Cave! We might also talk about our favorite and *least* favorite date nights together, but you’ll have to listen to find out! We hope this episode makes you laugh, and also gives you the motivation necessary to shake things up and spend some intentional time together! As always, please reach out to let us know what you think! Bacon is like Uber, but for all kinds of one time, short-term jobs! Sign up at www.bacon.work/bothofus to get an extra $5 when you work your first job! If you love us as much as we love you, please scroll down, hit ‘subscribe’ and leave a review! This episode is an adventure, guys. And it’s longer than usual because we just couldn’t cut anything out- it’s THAT GOOD. Today we chat with full-time adventurers and RV-living Cees and Madison Hofman! Two years ago they hit the road on a quest to visit all 59 National Parks, and never looked back. They are parents to baby Theo (AND cat parents to #vladimirkitten), and they still adventure all day long! We are seriously inspired by the simplicity and beauty of their lifestyle, and you will be too! Join us as we chat about the best sites in the U.S., how to make a marriage work within 10 feet of each other 24/7, how to parent on the road, and what it’s like to never stop traveling. We LOVE them. In fact, we kinda want to be them. Enjoy this episode, and let us know what you think!! And if you found as much value in these two as we did, please leave us a review! Join both of us in a very open conversation about some advice that has either been helpful, or not so much, in OUR marriage! Is it really a good idea to “never go to bed angry”? How can we be more vulnerable with our spouse? Why in the world is it so important to celebrate each other? These are some of the many topics we will cover in this brief, but fully-packed episode! Plus, we will catch you up on our trip to Hawaii, Maren will do some massive eye-rolling, and we will share some quick tips for marriage success! We are not professionals, we have just been there! We hope you enjoy a short peek into our marriage, and that it allows you to feel free to open up about what has worked (or NOT) for you! Lastly, we will announce the date and time in which we will pick the DISNEYLAND GIVEAWAY WINNER! And if you found any value in this episode at all, please hit subscribe and leave us a review! In this week’s interview, we welcome Aubrey Grossen (The Mamahood blog) to the show, for a very unscripted conversation about infertility, infant loss, marriage, and that one time her toddler destroyed a butterfly exhibit! Whether you are a wife, a husband, or a friend of someone who is struggling with infertility of any type, you will gain a lot from this episode. We feel so much love for Aubrey and her willingness to be so vulnerable and let us in on her personal struggles and thoughts. If this episode touched you in any way, or would touch someone you know, please share it! If you found any value in this episode, please subscribe and leave us a review! It means the WORLD to us to have you here with us. All Things Disneyland: Plus a Giveaway! Episode 3: All Things Disneyland: Plus a Giveaway! Plus, you’ll learn why ‘Pirates of the Caribbean’ smells so dang good! 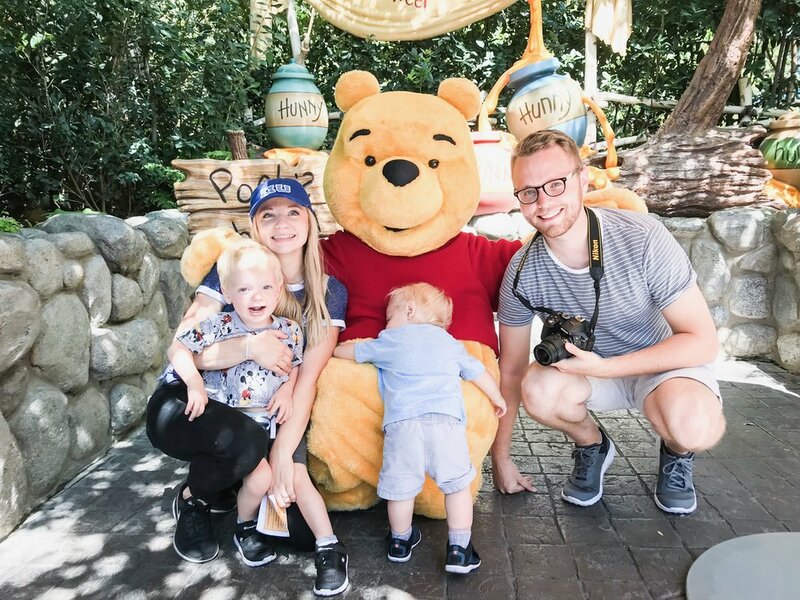 Get the lowdown on how Maren coped with being a short child at Disneyland, and hear some of our favorite Disneyland memories! We guarantee you’ll love this episode, and feel very much inclined to take another visit to the Happiest Place on Earth! 1. Subscribe to this podcast! 4. Share our giveaway on your Instagram story, by clicking the little arrow below the image! In this episode, Maren will sit down with Rachelle Valenzuela to talk body positivity, self love, and connection. Rachelle is incredibly honest and raw in this interview and you. will. LOVE IT. Rachelle has a platform where she speaks often about post-partum bodies and self love in Motherhood! Stay tuned to hear about the incredibly awkward circumstances of Rachelle’s first date with her husband, and why Alonso deserves MAJOR brownie points. We will also dig into how Rachelle learned to appreciate her body after drastic pregnancy changes, how to fight off negative thoughts, and the importance of speaking positively in front of our children. Rachelle will blow your mind with advice on how to stop comparing yourself, how to see your beauty, and how to have a healthy relationship with social media- as well as the importance of overcoming jealousy with love! We hope you enjoy this episode, and walk away with the ability to see everything that’s “unique and beautiful” about you! Don’t forget to subscribe and leave a review below if you found any value in this episode! We appreciate your feedback SO much. And don’t forget to subscribe and leave us a review below! We appreciate any and all feedback, and hope you’ll join us this season for so much more!